Ibn al-Haytham (Alhazen) was a philosopher, mathematician, and astronomer who was born in Basra, Iraq in 965 and died in Cairo, Egypt around 1040. He authored works in many different fields and concentrated on mathematics, optics, and astronomy. Alhazen wrote over twenty-five works on astronomy alone covering ideas from the location of the Milky Way to the size of the Earth (one of these works is titled Doubts Concerning Ptolemy). “Al-Alim al-Arabiy al-Hasan bin al-Haytham (the Arab Scientist al-Hasan bin al-Haytham)” by National Bank of Iraq. Wikimedia Commons. 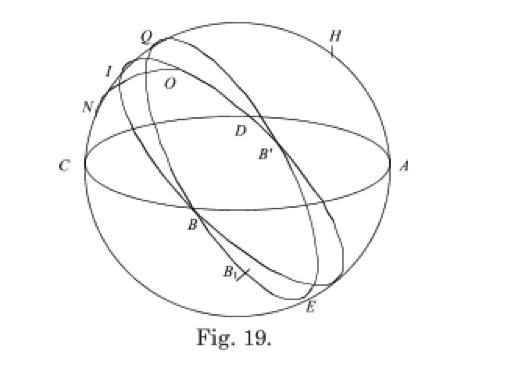 Alhazen was concerned with the astronomical discrepancies that existed in previous work such as Aristotle’s notion that celestial spheres exhibit uniform circular motion which is at odds with Ptolemy’s use of the equant. He criticized Ptolemy’s mathematical devices (i.e. epicycle, equant, etc.) for tracing the motions of the heavens and sought to account for astronomical observations with more accurate geometrical models. Alhazen’s work, Configuration of the Motions of Each of the Seven Wandering Stars, does just this. Alhazen had studied the daily motions of the five visible planets, sun, and moon and created “celestial kinematics” to explain their movements. In celestial kinematics, times associated with celestial motion are represented geometrically by the use of arcs and circles on a celestial sphere. For example, the moon’s motion is shown to be composed of an inclined orbit as well as orbital motion around the axis of the ecliptic (see picture). While accepting the Ptolemaic interpretation that Mars, Jupiter, and Saturn have inclined orbits that are constant and fixed, Alhazen challenges the orbits of Mercury and Venus observing that they oscillate slightly about nodal lines. These mathematical tools have been considered the first major advance in the study of kinematic direction. Alhazen’s On the Configuration of the World has been deemed his greatest and most influential work on astronomy. In On the Configuration Alhazen explains the basics of astronomy and geometry and compares them to ideas from natural philosophy. The work poses ideas from geometry next to similar ideas from natural philosophy and summarizes where the two realms of thought intersect and can coexist. Alhazen, however, does not delve into the discrepancies between the two but his work is cited as inspiration for Nasir al-Din al-Tusi who worked on resolutions to these problems. By explaining the basics of geometry and astronomy and by limiting the use of mathematics, Alhazen made On the Configuration comprehensible to many people of and after his time. Its success has been partially attributed to this simple type of writing. On Configuration was translated into Spanish, Latin, and even Hebrew; and influenced other astronomers, mathematicians, and philosophers as well as the general public. In addition to his work on Ptolemy’s astronomy, Alhazen also criticized Ptolemy’s optics and reversed his idea that light originated within the eye and traveled outward. Alhazen also discovered that twilight ceases and begins when the sun is below or above a certain angle on the horizon and based on this discovery calculated the height of homogenous atmosphere to approximately 55 miles. Alhazen has been nicknamed Ptolemaeus Secundus (Ptolemy the 2nd) for his great contributions to astronomy. From a 1572 Latin edition of Alhazen’s optical work. Courtesy of OU History of Science Collections. CHRISTIAN HOUZEL (2009). THE NEW ASTRONOMY OF IBN AL-HAYTHAM. 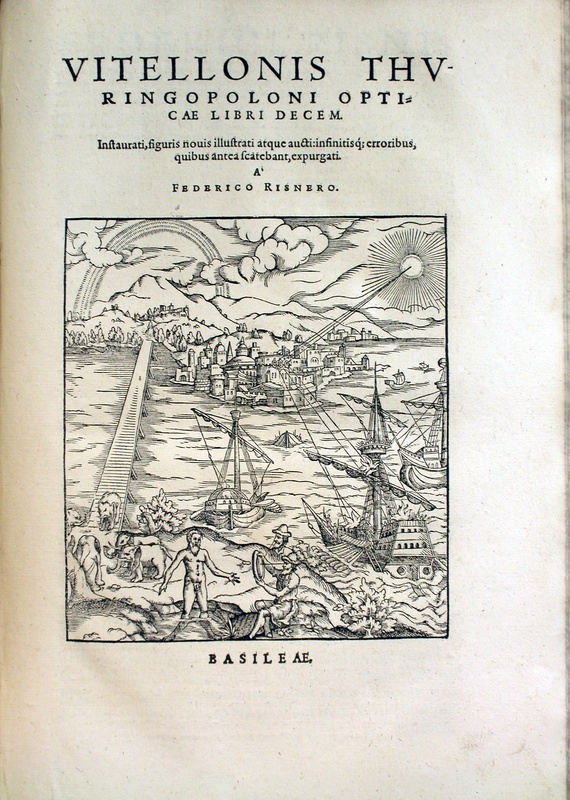 Arabic Sciences and Philosophy, 19, pp 1-41. Citation — Alhazen. Six Geometrical Lemmas. 1011-1021 A.D. Book of Optics. University of Oklahoma Library. Go.galegroup.com. 2/9/2014.